Hexonator, Other Effect Plug-in from Sinevibes. 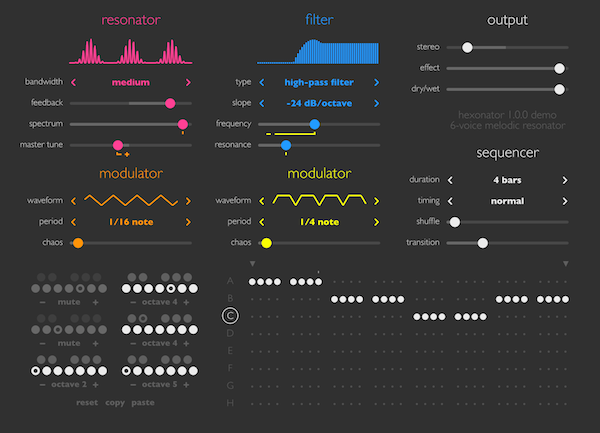 Sinevibes launches Hexonator, a new spectral effect in AU 32 and 64-bit format for Mac OS X. 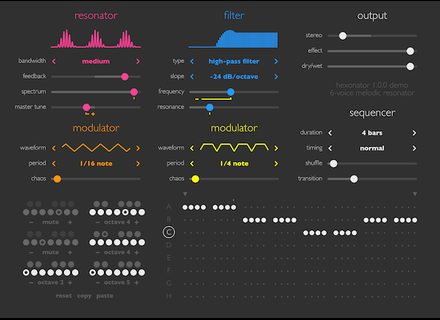 According to Sinevibes, Hexonator is designed to create “organic” chord progressions, melodic textures, ambient drones and more. The plug-in uses for that six melodically tuned resonators, a chord sequencer, a multimode filter (high-pass, band-pass, low-pas with 12 and 24dB/octave slopes) and two modulators with multiple waveforms and an adjustable “chaos” mode. The Hexonator AU plug-in can be installed on Mac OS X 10.6 and later. It is available for $39 at www.sinevibes.com/hexonator/, where you will also find a trial version. Audio Assault launches metal amp simulations Audio Assault makes its debut with GrindMachine, a collection of guitar amp simulations designed for metal players. Auphonic Leveler processes multiple audio files Austrian company Auphonic introduces Leveler, a batch file processor for Mac OS X and Windows. Secret Base Design launches a dual synth on iOS Secret Base Design released on the AppStore the Nice To Be Your Friend Synth, a universal iOS app that is currently free for a limited time.